A recent survey conducted by the Harvard Business Review shows that 73% of all consumers use multiple channels while shopping and that multi-channel consumers spend more money than their single-channel peers. In other words, OmniChannel banking consumers are a windfall for businesses, and everyone should develop a strategy to take advantage and find ways to remove legacy banking system obstacles. Most of the discussion around OmniChannel strategies focuses on retail businesses, not banks, but there’s a place for banks in the OmniChannel world. Forrester Research describes the ideal form of OmniChannel banking as a breaking down of silos. Prior to OmniChannel, banks had a silo for their branches and ATMs, a silo for their call center, and a silo for the internet. Each drew from a separate pool of data and had separate tools. OmniChannel banking ensures that each banking outlet, be it ATM, call center, internet, or smartphone, uses the same pool of data and the same tools. This serves the customer better – and prevents replication of efforts and data. 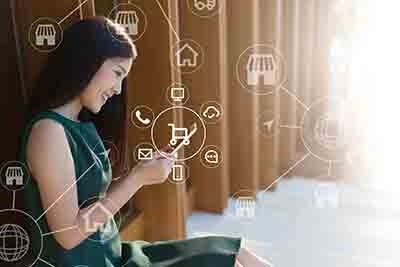 For banks to successfully implement an Omnichannel banking strategy, they need to connect their legacy banking systems – which in many cases are decades old and still running on AS/400 infrastructure platforms – to modern systems such as smartphones and tablets. More to the point, they’ll need to do this at scale. The only way to do this is with APIs that will speed development, make it easier to integrate with external systems, and allow banking systems to absorb the pace of change without breaking. APIs let developers – from any industry or discipline – deliver better software, faster, and for less money. First of all, they prevent banks from reinventing the wheel unnecessarily. As a first example, think about a bank trying to create a location-aware service for their mobile app that displays branch locations for their customers. Obviously, a bank isn’t going to create their own digital, software-assisted map, or develop the GPS software that would pinpoint a user’s location (at least, we hope not). Instead, they’d probably use the Google Maps API, which is relatively inexpensive and extremely easy to use. The API, in this case, prevents banks from having to reinvent the wheel. On a more nuts-and-bolts level, APIs let developers quickly translate the antiquated protocols used by legacy systems into modern systems of engagement. Most of your developers probably prefer to program with frameworks that use JSON, HTTP, and REST. Your bank’s legacy hardware is probably using a programing language from the 1970s known as COBOL. Once an API is completed that unites the older protocols with newer frameworks, your developers will be able to code in the frameworks that they choose, preventing them from having to retrain in an older language. The relationship between traditional banks and FinTech startups has been slowly thawing, and Open APIs are a large part of the reason for this technological perestroika. Some of this is due to the facts mentioned above: APIs help legacy systems deliver data to modern applications. The reverse, however, is also true: APIs help modern applications acquire rich data from legacy banking systems. APIs prevent both banks and FinTechs from having to reinvent the wheel. More to the point, APIs alone aren’t helping the bank-FinTech relationship. A growing push for API standardization has been continually pushing the two industries together. Since May of 2017, an organization known as the API Standardization Industry Group has been working to develop an API playbook that creates a unified metric for security, automation, and flexibility as pertains to the creation of APIs. Eventually, the use of standard APIs between banks and FinTechs will foster collaboration, as opposed to uneasy coexistence. If nothing else, providing easy-to-use APIs for FinTechs will allow banks to monetize an aspect of their relationship. Charging a fee per transaction, per API call, or sharing revenue are all popular ways to monetize APIs. Over the last few years, there have been a number of stories about how traditional banks’ reliance on legacy technology could literally kill their business. Malfunctioning legacy banking systems has previously frozen customers’ ability to make or receive payments, or unable to access their accounts. Worse yet, the individuals who have expertise in maintaining legacy banking systems are beginning to retire en masse – and there are scarce few individuals willing to learn the skills necessary to replace them. Therefore, banks need to adopt a “when, not if” approach to ripping out and replacing the legacy banking system that sustains them. By adopting APIs, however, banks may be able to push “when” out a few more years. APIs are already extending the lifespan of legacy banking systems by translating their outdated frameworks into formats that modern applications can use. This makes previously unfriendly systems into the lynchpin of responsive, scalable, and customer-oriented applications. Lastly, although banks will still need to replace their legacy hardware eventually, APIs give them the cover they need to do a “soft” refresh. Instead of ripping out and replacing their legacy hardware all at once, they’ll be able to gradually test alternatives. With zero outages and well-tested replacement, the only thing that customers will notice is that their apps have gotten even better. In the meantime, banks need to spend time and energy understanding how creating APIs can best serve their customers, vendors, and partners. OpenLegacy can help. If your developers are suffering from API writer’s block, take a look at our free case study where we show how a major bank used OpenLegacy to implement .